November 16, 2011, was the day I started my journey into fitness blogging with my first ever fitness-centered post. I had this blog since 2008 but didn't get focused on fitness until 2011. So much has changed since that first post. Blogging changed my life. I have met so many friends, traveled many places, crushed many goals, and have grown as a human. I started this blog in 2008 (a decade ago!). In 2011 I changed the name to Running for Dummies. In 2013 I realized that was dummy move and changed the name to Running with Ollie. 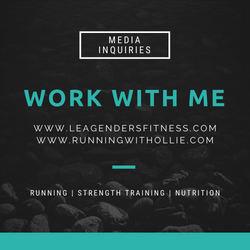 In 2015 I got certified as a personal trainer and running coach and started a new website on www.leagendersfitness.com. I tried to keep up the two sites for a while. At first, I'd publish one post a week here, then it turned to one post a month. The truth is that now ten years after its inception, and seven years after my first ever fitness post, I've outgrown this blog. 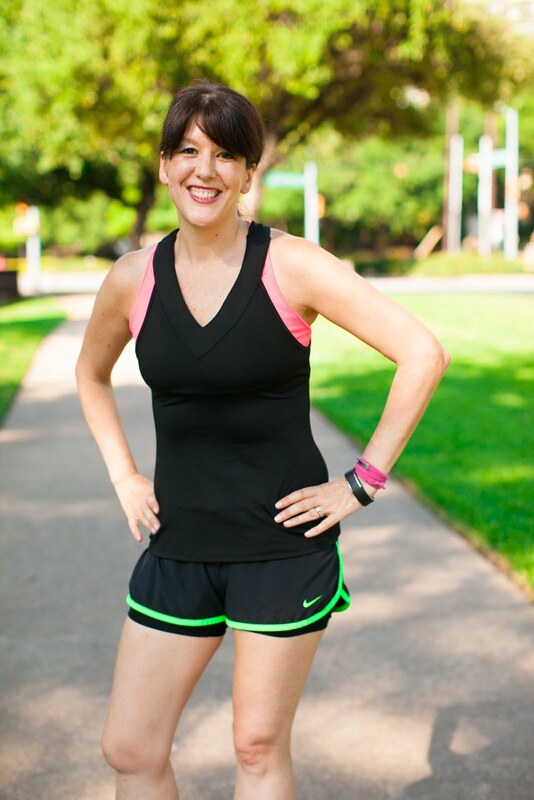 This blog is my baby but my focus is on growing my fitness and freelance writing business. I do that over on www.leagendersfitness.com. I love what I started here. I love what it has become. I love what I have become. But Onward and Upward. I strive to provide free and valuable fitness content to my readers. Please visit me now at these sites. I am here to help! One of the highlights of my month is when I get to share my favorite four-legged runners on the web. I almost let October slip by without a feature, but my Internet friend Susan at @swheeler29 saved the day. I love following her trail adventures with her dog. She always has a big smile and an adventurous spirit. 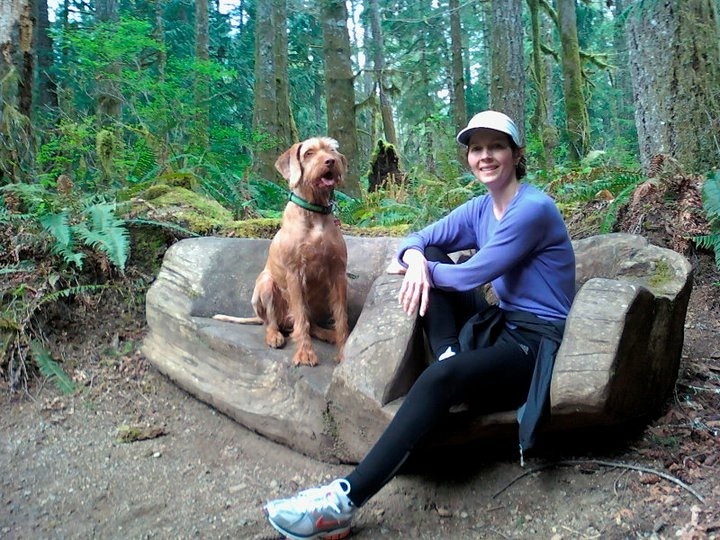 Susan, Tell us about your favorite four-legged running partner! Meet Maleki aka Monkey. 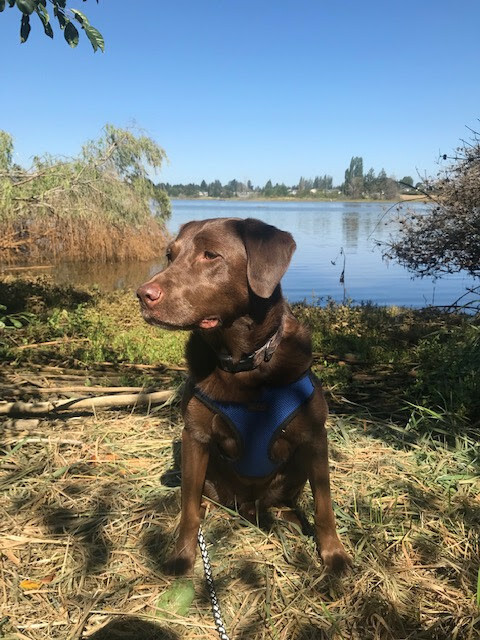 He's a 6-year-old chocolate lab! Monkey does a great job posing for pictures! I think I have taught him well or he cooperates knowing I will bring him on another adventure! 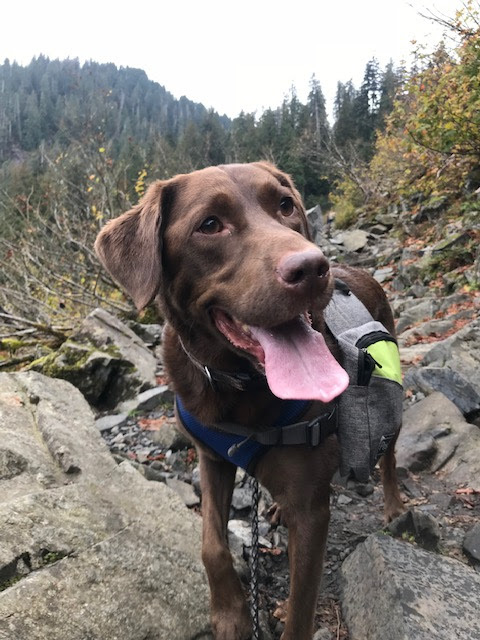 He is also the best hiking buddy! He wears a pack and carries his own water and food. He is so motivated when we hike, he walks past everyone with determination on his face! The first thing he does when we get to the lake is go swimming! I always try and pick a hike with a lake for him to jump in. Where is your favorite place to run with Monkey? Trail running is our favorite! I started trail running a couple of years ago after being tired of running on the streets. I found trail running to be so tranquil! We both love being in the woods. Monkey loves to be off leash, but he gets a little overzealous and runs ahead too far for me to see him (just like a little kid) So most of the time he has to stay on the leash. How you ever raced with your dog? Yes. We usually race a few times a year. The UW Dawg Dash is one of our favorite. We didn't run it this year, but well be back next year! Monkey loves racing! He is like a little kid always ready to go! Dogs are forgiving animals. They give us unconditional love and affection. We are lucky to have them. They all deserve a home, love, respect, and fair treatment. How does Monkey make you laugh? I can't say the words walk, run, hike, or take "you know who" outside before I am completely ready to walk out of the house! He gets so excited that he barks and follows me until I'm ready! He's a little crazy. If I say any of those words he runs over to where his harness and leash is kept and runs back and forth and barks until I'm ready! I can't even touch his running/hiking pack without being ready or he will start barking! Thanks Susan! You can follow all her adventures with Monkey on Instagram! If you have a dog, who loves to run or walk sign up to be featured next! 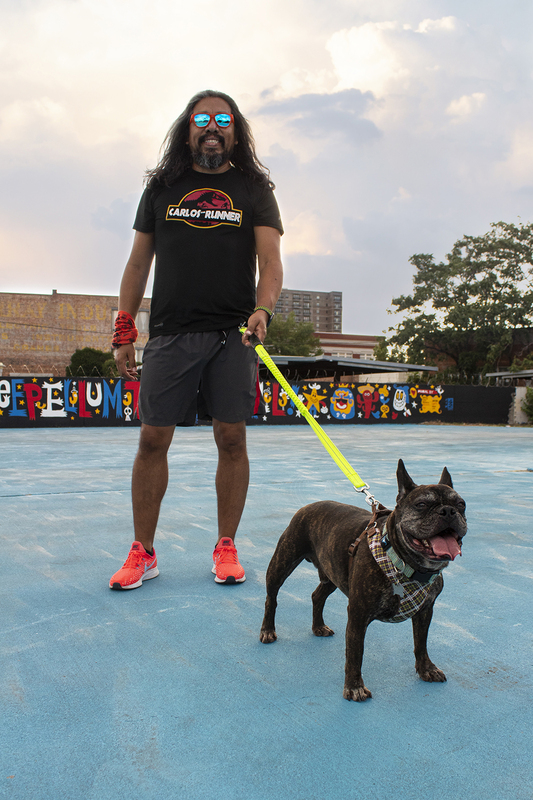 Would you like to be featured with your four-legged running partner? Hi, Friends! 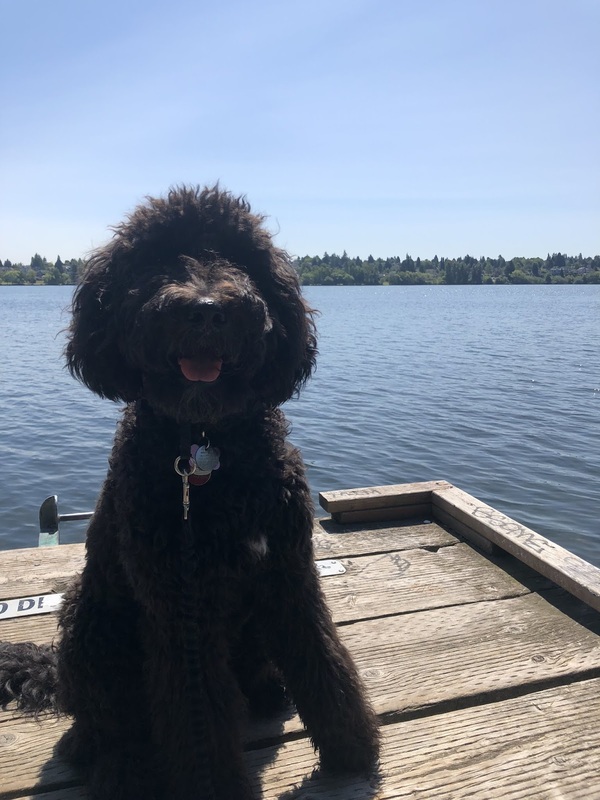 Welcome to the latest edition of Tuesday Tails Furry Feature when I share the best four-legged runners on the internet (and their humans). This week I am especially excited to introduce you to Shanique and Siggy from Seattle. I met Shanique at BlogFest this year and I am thrilled for you to meet her! Tell us a little bit about Siggy! Siggy is a 9-month-old Goldendoodle. She's the most curious thing ever, loves chest and belly rubs, car rides, other doggies and most of all people. If she meets a dog that's not too happy with her wiggly, jump all over you to meet you puppy self, that's okay, she will just give all that attention to their human. She loves being outdoors, sniffing and exploring every nook and cranny and will never find a stick she doesn't like and want to take home. Her favorite thing to do is play tug with a rope toy, and if you let her have it, she will run off to a soft spot where she can lie down and chew. Since I just started running with her, we've only done short (2 miles or less) runs around our neighborhood. However, we do long walks on this one trail with views of a huge lake or hike the trail of a park close to the beach. Running my first 10K 4 years ago. I dislike running and somehow thought setting to a goal to run a 10K was a great way to challenge myself to get over it. Training for a few weeks made running a consistent habit, and while I still am not a fan of running, I've learned to appreciate the lessons it has taught me. To just be open to exploring. At the very least use the opportunity to appreciate nature and its many offerings. How does Siggy make you laugh? She likes to run it seems, and if I slow down or stop, she will keep pulling me as if to say" why did you stop." If you manage to start rubbing her chest or underbelly, the moment you move your hand she paws at it as if to say "Don't stop! Keep doing that. Every single time. You can follow Shanique and Siggy at We are Fab Fit Friends on Facebook, Instagram or Twitter! How can you not love that face? Go show Shanique and Siggy some internet love. If you've wondered where I've been lately. I've been hanging out over on www.leagendersftiness.com. See me over there. If you have a dog, who loves to run or walk sign up to be featured next! 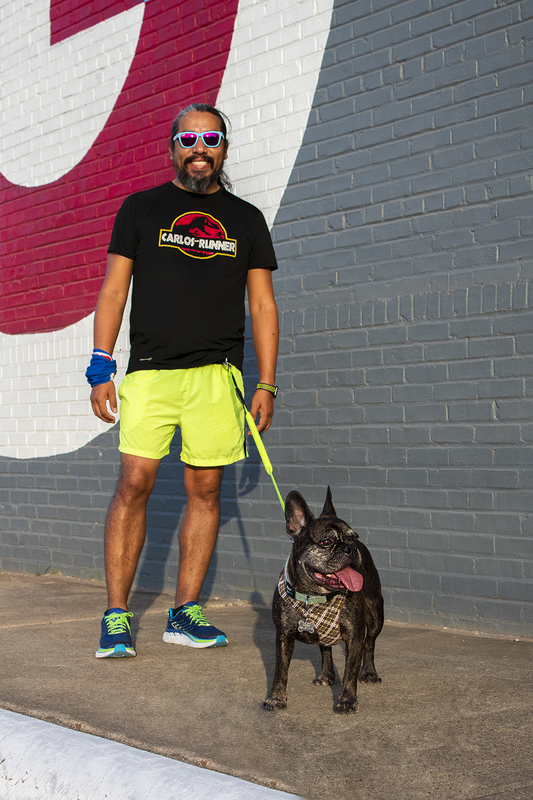 Would you like to be featured with your four-legged running partner? Hi, friends. 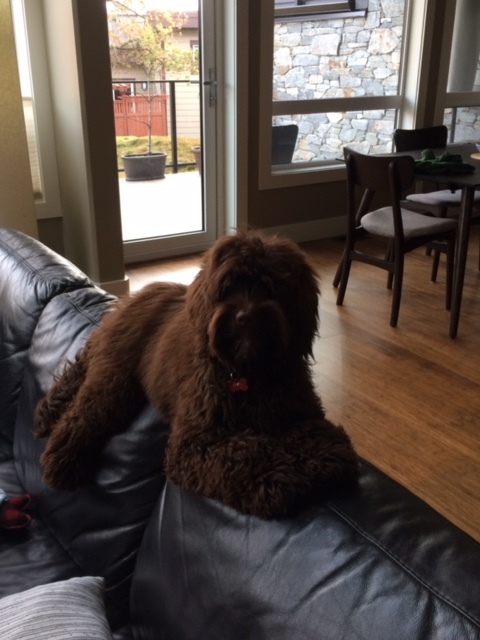 Welcome to the latest edition of Tuesday Tails Furry Feature! I am excited to introduce you to this month's furry feature! Meet Jen, otherwise known as The Fit Nana. She was my roommate at BlogFest. She is a runner, a CrossFitter, a trainer and a photographer. When I asked her if I could feature her four-legged buddy in this feature, she didn't think she qualified because her Abbey doesn't run! But we don't discriminate around here, if you have an active dog, I want to feature you and your best bud. Walkers welcome! Meet The FIt Nana and Abbey! Hi, Jen! Tell us a little bit about Abbey! 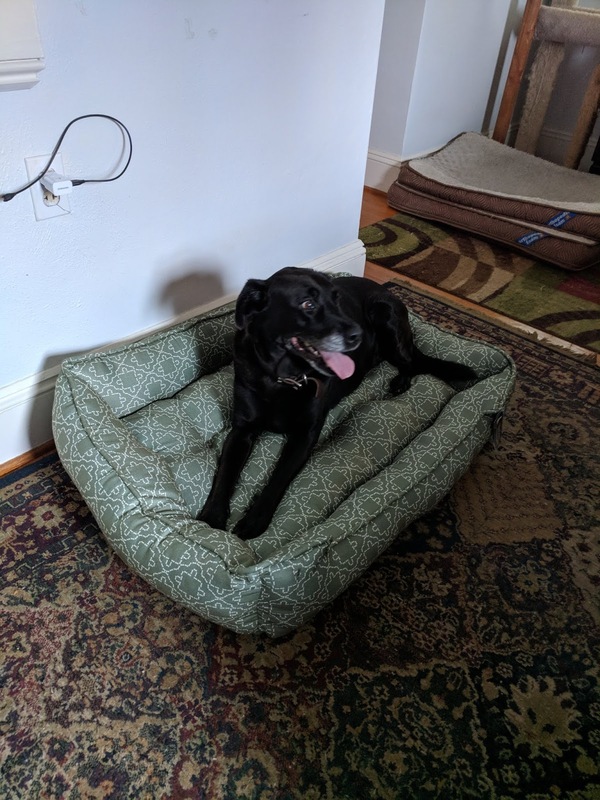 Abbey, she's a lab mixed with something. We have no clue. We sometimes think maybe Jack Russell because she can be super hyper and she just turned 12 in May! We don't run, we walk, and she just loves the neighborhood behind our house. Lots of bunnies, kitties, and other dogs to sniff out. Maybe to the food that fell on the floor. Finishing my first marathon back in 2008. I actually cried as I crossed the finish line. Enjoy the simple things. 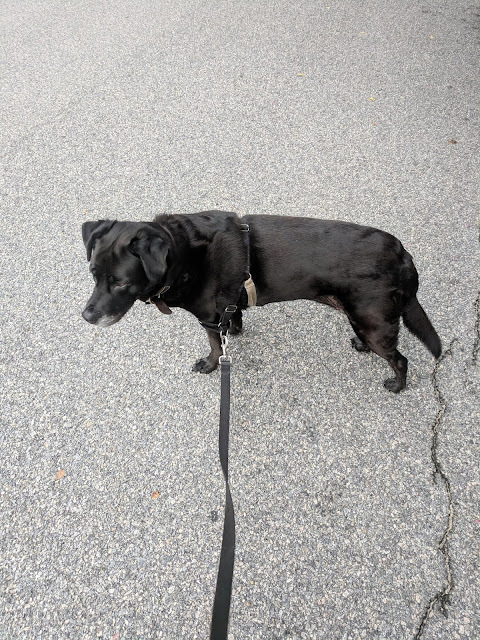 We make take walking for granted or think of it as a chore but she's super excited every time we head out, regardless of the fact we're walking in the same place every day. Also, sometimes, you just have to stop and smell the roses. Or the mailbox. Or the fire hydrant. Haha. Point is - don't let life pass you by, be a part of it! How does Abbey make you laugh? She's bossy! Whenever the cats are playing (or play fighting) she always has to break it up! This is normally fine except for when they get into a spat in the middle of the night and the next thing I know, there's a 60-pound dog on the bed! Yikes! I think she needs a buddy. Lately, I'll hear her crying and howling when I get back from a run. She may be getting a puppy soon! Her brother died last August and she's been an only dog since then. I think she's lonely. If you've wondered where I've been lately. I've been hanging out over on www.leagendersftiness.com. See me over there. If you have a dog who loves to run or walk sign up to be featured next! Would you like to be featured with your four-legged running partner? Hi, friends! I am ridiculously excited to introduce you to this month's Furry Feature! Carlos The Runner is a local Dallas/Fort Worth runner with a reputation for being fun, social, creative and incredibly generous. He's all over the running scene here. Wherever there's an event you can bet Carlos will be there. 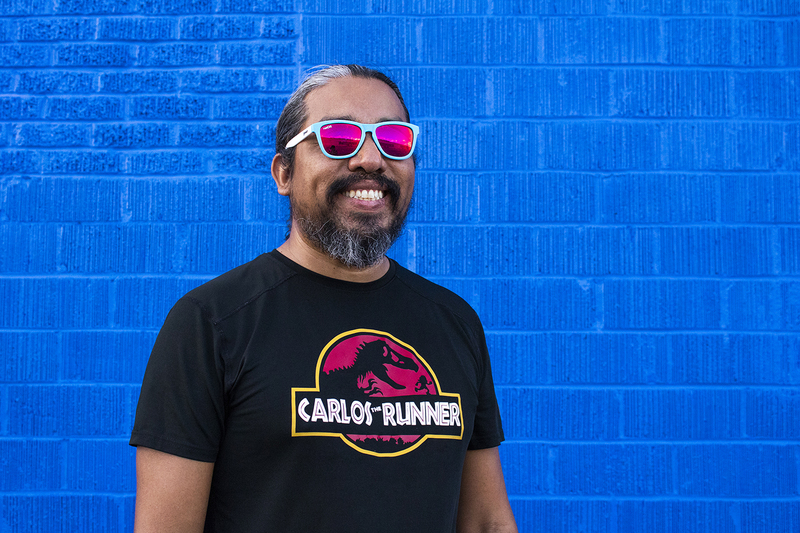 He may be best known for his outrageous and fun #dinorunfie (and if you don't know what that is, you have to check it out). 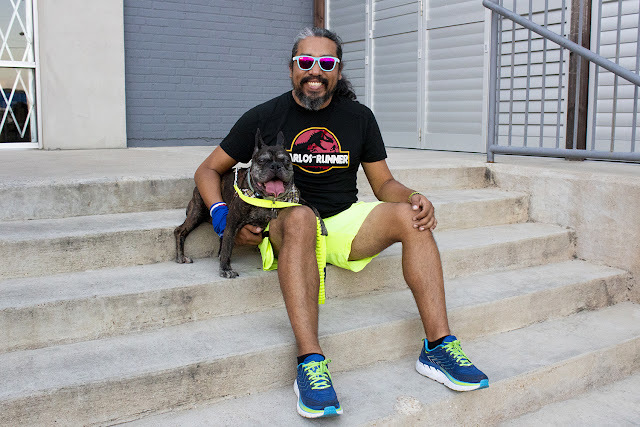 If it wasn't enough that he's a runner and an active member of the running community, he also has the cutest dog who of course, loves to run too. When I first saw Hitch on Carlos' social media accounts, I knew that Hitch would steal the show in this feature! Meet Hitch and his human, Carlos the Runner. Hi, Carlos! Tell us a little bit about Hitch! 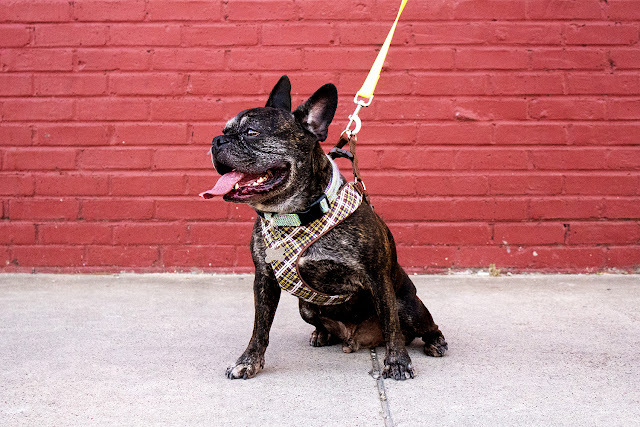 His name is Alfred Hitchcock aka “Hitch” he is a brindle 5-year-old Frenchie, and he loves takis, pickles, and bananas...oh! And also running! 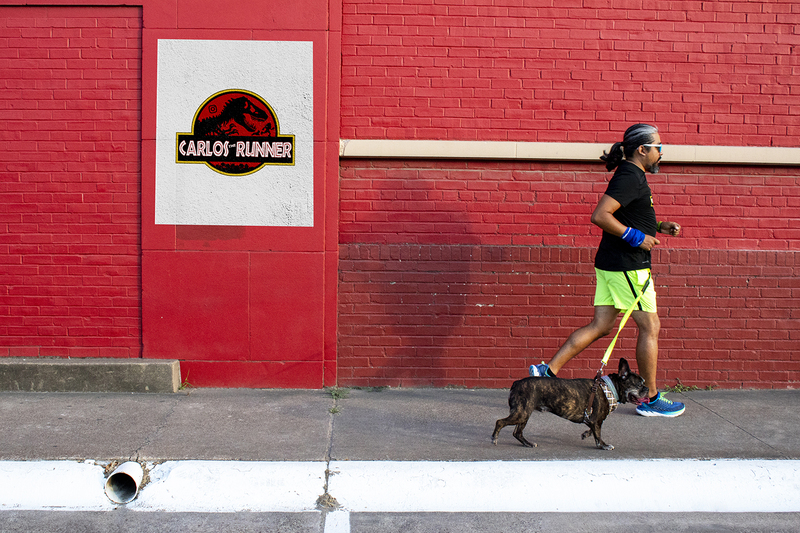 We run around our neighborhood all the time. No! We’ve been missing out on that! But I love taking hitch to events sometimes because people know him, and they get excited to see him. He has a very sociable personality. My recent most proud moment is finishing my first 50-miler. The most important one I learned from Hitch is that he always has a right attitude towards running, he is always up for a run, it’s the kind of passion I think most runners wish to have on a daily basis. How does Hitch make you laugh? Well, one of the funniest things about Hitch is how crazy he gets when I ask him if he wants to go for a run! He gets super excited, and the only way to calm him down is to take him out for a run! Thanks, Carlos! 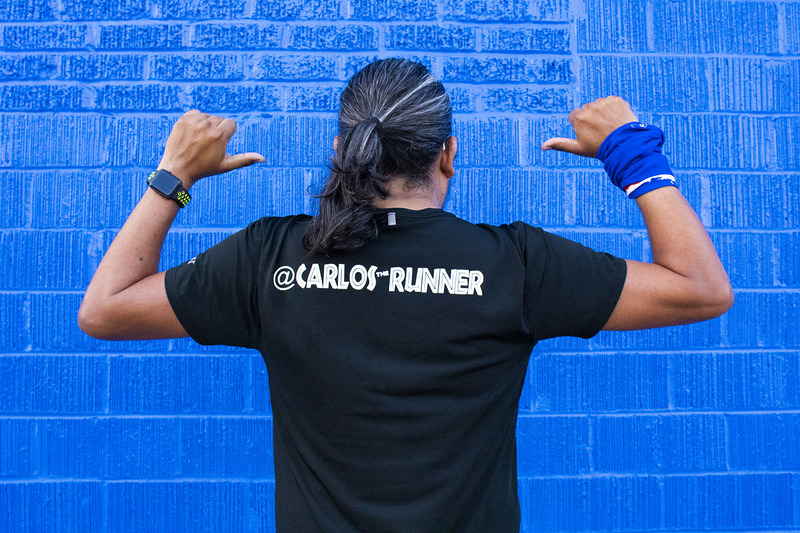 Go follow CarlosTheRunner on Instagram to follow along with all the fun! When I said, Carlos was generous, this is what I meant...he made this picture for me and shared on social media! Isn't it great? Ha Ha. p.s. If you've wondered where I've been lately. I've been hanging out over on www.leagendersftiness.com. See me over there. 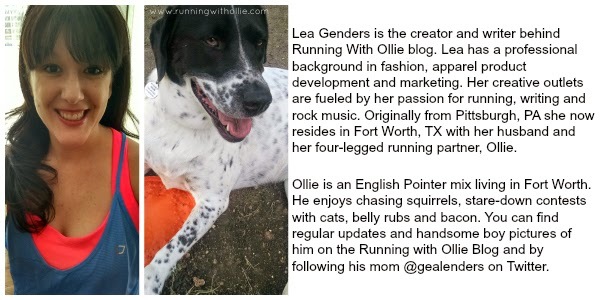 If you have a dog who loves to run sign up to be featured next! 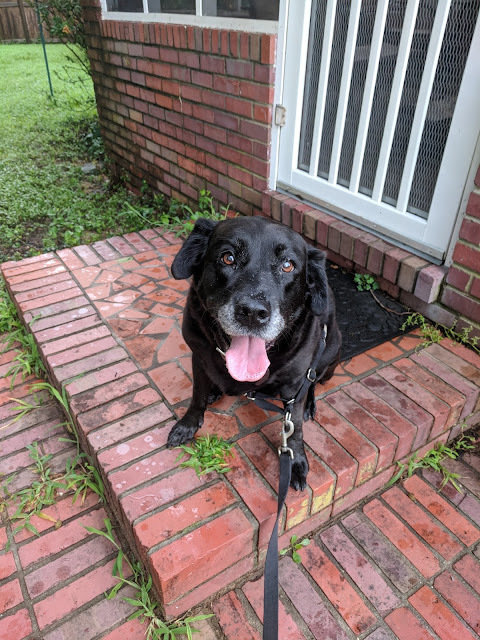 Welcome to the latest edition of Tuesday Tails Furry Feature where I introduce you to the best four-legged runners on the internet. 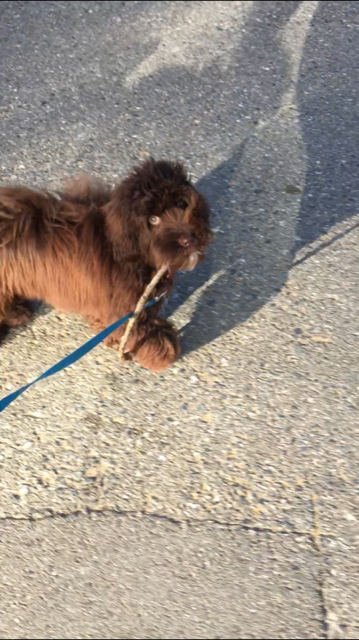 I am excited for you to meet my friend Denise from FitPsychology and her walking buddy, Hazel. Denise and I have been blogging friends for a long time and when she posted this video on Instagram I asked her if I could feature her even though she doesn't run. 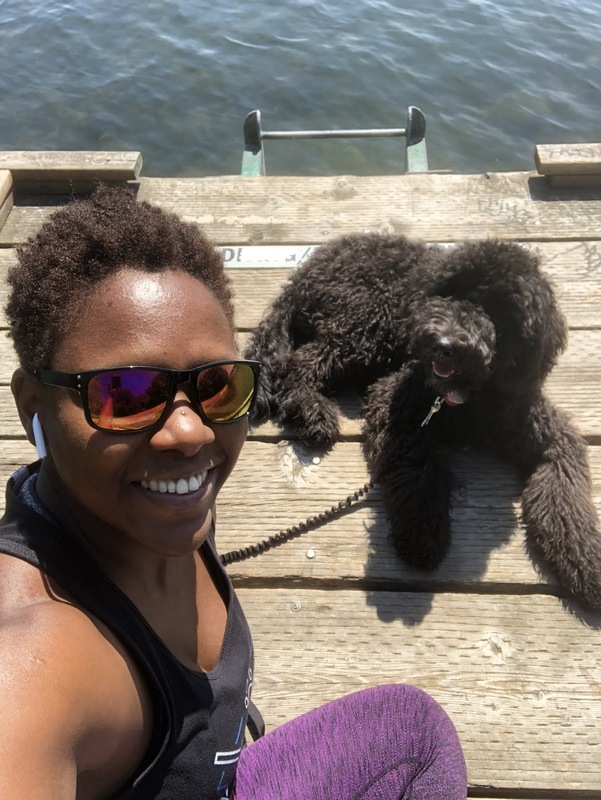 I am always looking to share the stories of people who are active with their dogs, running or walking. Hi, Denise. Tell us a little bit about your favorite walking partner. 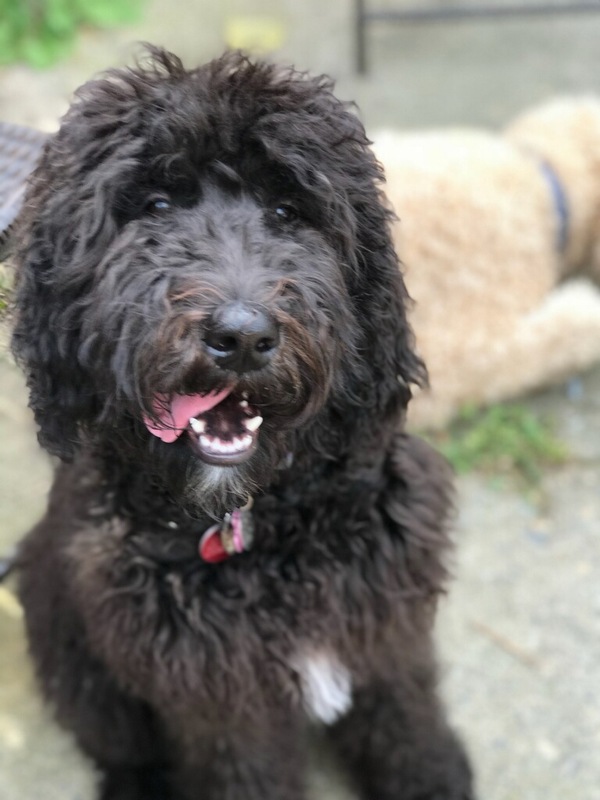 Hazel is a 3rd generation miniature Australian Labradoodle, she’s 8 months old and full of life. 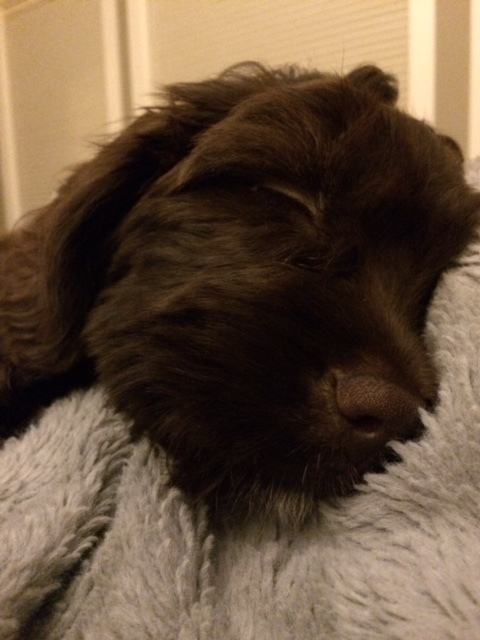 We lost our 14-year-old wire haired vizsla, Lily, last March and I swore I’d never get another dog. That was way too painful a loss to go through. But then...my husband showed me a picture of pups from an island breeder and well, here we are. Hazel approached us and the rest is history. She has filled our life right back up. Dogs have a way of doing that. Where is your favorite place to be active with your pooch? We have a few walking routes but our favorite is Westwood Lake. It’s a 6 k trail loop around the lake populated year-round by runners walkers and dogs. It’s our happy place. Don’t worry, she gets to run with my husband when I’m not around. When I was running, before I partially tore my rectus femoris muscle during a trail descent, I participated in a local trail series here on Vancouver Island called Gut Busters. The Mt Washington event was probably my proudest running moment because of the elevation. But the actual proudest would have to be the Oceanside Mother’s Day 10k road race. It was the first time I ran 10k nonstop but what made it the best was my son, who was 18 at the time, ran it with me! Best Mothers Gift ever! 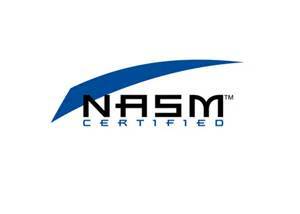 To always great people with enthusiasm! Have you ever had a bad day, then walked into the house with a dog? That dog will love all over you until you have no choice but to smile! We need to do more of that. Dogs are healing. My husband is retired military with PTSD. I believe having a dog in the house provides an emotional outlet and constant companion. The positive energy a dog gives off plus the necessity of getting outside serves to heal in big ways. Do you have any advice for running or walking with your dog? When you’re out running or walking with your dog, make sure you let them stop and “smell the roses.” It’s their life too. 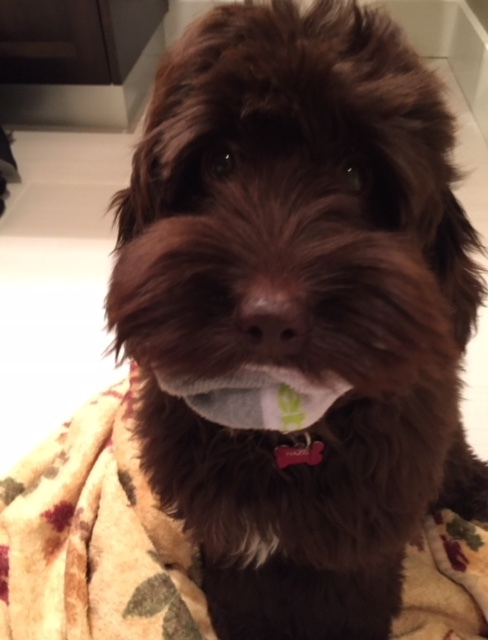 We’ve only had her for 6 months but if you know Labradoodles at all, they’re pretty goofy. A Mini Labradoodle is even goofier in my mind as they have that constant cuteness factor going for them! I don’t have a funny story so much as her actions are funny. Especially the way she hangs over the sofa with her back paw up on the arm. She looks like a wise old man. Also, we call her a cat as she stands and lays on the back of the sofa. Want to be featured next? Fill out this form to be considered. Learn more about why I'm requesting more dogs to feature than usual. Like this post? Know someone who runs with their dog? Please consider sharing. Do you run with your dog? Do you want to share your favorite furry-faced running partner with the world, or at least my corner of the internet? 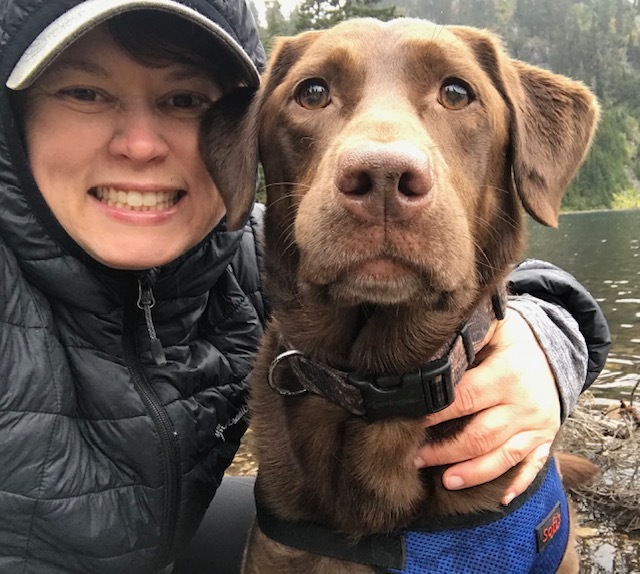 I want to feature you and your puppy pacer! 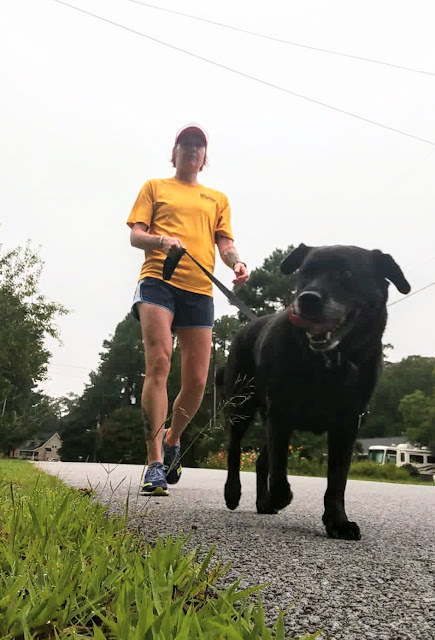 I love to share the stories of runners and their favorite four-legged running partners! I am accepting guest posts that tell a unique story about running with your dog or you can be part of our furry feature and answer some questions about running with your dog, like this one. I have some great features lined up for the next few weeks that I can't wait to share with you! Want to be featured next? Fill out this form to be considered. The new doggie features kick off in May. Learn more about why I'm requesting more dogs to feature than usual. Like this post? Do you know someone who runs with their dog? Please consider sharing.